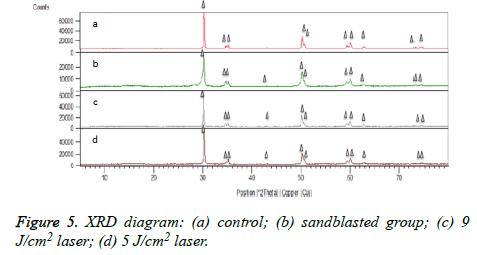 Objectives: This study sought to assess the effect of energy density of neodymiumdoped yttrium aluminium garnet (Nd:YAG) laser on morphological characteristics and phase transformation of zirconia ceramic and its microshear bond strength to resin cement. Materials and Methods: Sixty zirconia discs (7 × 2 × 10 mm) were divided into four groups (n=15). Group C received no surface treatment (control). Group S samples underwent sandblasting with 50 μ aluminum oxide particles. Group L9 was subjected to laser irradiation with an energy density of 9 J/cm2 and group L5 was subjected to laser irradiation with an energy density of 5 J/cm2. One disc of each group underwent atomic-force microscopy (AFM) and scanning electron microscopy (SEM) analyses for evaluation of surface morphology. Phase transformations were evaluated by X-ray diffraction (XRD). Small cylinders of Panavia F2.0 resin cement were fabricated and placed on treated surfaces; samples were incubated at 37°C for 24 hours and were then subjected to microtensile tester for measurement of microshear bond strength. The Welch test and Games-Howell test were used for data analysis (P<0.05). Results: Surface-treated groups were not significantly different in terms of bond strength but had significant differences with the control group (P<0.05). The highest surface roughness and the highest frequency of cohesive failure were noted in groups S and L9. In all samples, tetragonal phase decreased after surface treatment and no tetragonal to monoclinic phase transformation occurred in any group. Conclusion: Nd:YAG laser irradiation changes the morphological properties of zirconia ceramic and increases its surface roughness. It can also increase the microshear bond strength of zirconia to resin cement. Increase in Nd:YAG laser energy results in higher surface roughness but cannot cause a significant change in microshear bond strength of zirconia to resin cement. Laser irradiation with the parameters employed in our study does not cause any phase transformation. Chemical stability, biocompatibility, adequate compressive strength, coefficient of thermal expansion similar to that of dental hard tissue, favorable esthetics and the ability to restore natural tooth-like appearance are among the favorable properties of zirconia responsible for its increasing popularity among all-ceramic restorations [1-3]. Use of zirconia has increased in modern prosthodontics because it is a suitable material for fabrication of posterior all-ceramic single crowns, multi-unit and long-span fixed partial dentures and implant abutments [4,5]. On the other hand, zirconia is the only ceramic that can eliminate cracks or prevent their propagation within its structure [4,6] due to its poly-crystalline nature. Zirconia has three crystalline phases at different temperatures namely the monoclinic, tetragonal and cubic phase. Pure zirconia is in the monoclinic phase at room temperature. It has tetragonal phase at temperatures over 1170°C and cubic phase at temperatures over 2370°C; it is only stable at very high temperatures [1,7]. Despite unique properties of zirconia, the conventional cementation techniques cannot provide adequately high bond strength due to issues such as absence of silica phase and glass in zirconia ceramic; therefore, challenges with regard to bond to zirconia have been the topic of many investigations [3,5,8-10]. Proper surface treatment techniques are critical to obtain a reliable mechanical or chemical bond and ensure clinical success of restorations. Several techniques have been proposed for zirconia surface treatments such as acid application, abrasion, use of adhesive agents and silane coupling agent [2,3,11]. Sandblasting or abrasion by aluminum oxide (Al2O3) particles has been widely accepted to increase the shear bond strength of zirconia to resin cements [3,10,12-15]. Another commonly used surface treatment technique is laser irradiation, which can be performed chair-side. Solid state lasers such as Nd:YAG are applied to treat tooth hypersensitivity  and for caries removal , sealing of pit and fissures , dental bleaching  and disinfection of tissues . It has been confirmed that application of Nd:YAG laser to feldspathic ceramic prior to cementation increases its bond strength compared to etching with hydrofluoric (HF) acid . Some studies have shown that laser-treated surfaces of alumina-based ceramics show a micromechanical retention pattern [22,23]. Some other studies compared the effect of Nd:YAG laser irradiation on surface roughness of zirconia and bond strength to resin cement with that of common methods like sandblasting and showed the roughest surface and highest bond strength following the application of short pulse Nd:YAG laser [8,24]. Nd:YAG laser irradiation along with air abrasion with particles has also been shown to increase the bond strength to resin cement [12,25,26]. It has been reported that surface treatment with Nd:YAG laser with or without air abrasion creates a uniform roughness on the zirconia surface and increases the microshear bond strength [25,26]. Nonetheless, some studies have shown inefficacy of Nd:YAG laser for improving the surface properties of zirconia or increasing its bond strength . Considering the significance of this topic and variability of techniques as well as the fact that the superiority of none of the available techniques over the others has been confirmed, this study sought to assess the effect of two different energy densities of Nd:YAG laser on bond strength, surface roughness and phase transformation of Y-yttria stabilized zirconia (Y-TZP) ceramics. Sixty zirconia discs measuring 7 × 2 × 10 mm were fabricated of Y-TZP zirconia blocks (Zirkonzahn Steger, Ahrntal, Italy) by sectioning. The bonding surface was polished with 300, 400 and 600 grit silicon carbide abrasive papers and the samples were sintered according to the manufacturer’s instructions (sintering at temperature 1500°C for 2 hours). All discs were placed in an ultrasonic bath containing 96% ethanol for 10 minutes for cleaning prior to surface treatment and were then dried. Samples were then randomly divided into four groups (n=15). Group C: Fifteen control samples in this group received no surface treatment or laser irradiation. Group S: Fifteen samples in this group were sandblasted with 50 μ aluminum oxide particles (True Etch, Orthotechnology, FL, USA) at 4 kg/cm2 pressure and 10 mm distance by a micro etcher (Danville engineering, USA) and were then immersed in an ultrasonic bath containing 96% ethanol for 10 minutes to eliminate any loose particles on the zirconia surface. Group L9: Fifteen samples in this group were irradiated with Nd:YAG laser (1.064 nm, Q-switched, 10-12 nanoseconds pulse duration, mean spot size of 400 μm, maximum energy of 100 mJ and energy density of 9 J/cm2). Group L5: Fifteen samples in this group were irradiated with Nd:YAG laser with 5 J/cm2 energy density. One disc of each group was subjected to AFM (Nanowizard II, JPK, Germany) and SEM (Seron, AIS2100, Korea) at x1000 and x5000 magnifications for assessment of surface morphology. Phase analysis was done using XRD (X’Pert Pro MPD, PANalytical 2009, Germany). 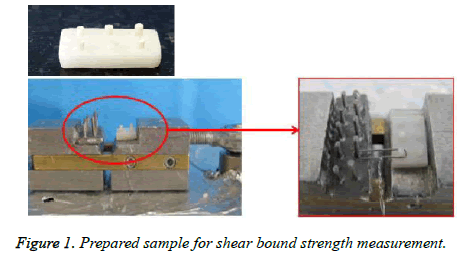 Figure 1: Prepared sample for shear bound strength measurement. Where F is the load applied in Newton and A is the surface area in millimeters. Debonded surfaces were then evaluated under a light stereomicroscope (Carl Zeiss, Germany) to determine the mode of failure. Mode of failure was determined as adhesive (failure at the cement-zirconia interface), cohesive (fracture within the cementor zirconia) or mixed (combined adhesive and cohesive). The mean shear bond strength in the groups was reported as mean, standard deviation (SD), minimum and maximum values. Due to inequality of variances, Welch test was applied for data analysis. The Games-Howell test was used to compare different groups due to inequality of variances and being less conservative than the Tamhane’s test as well as small sample size yet more than 5 (n=15). The resulting surface topographies for the control and 5 J/cm2 laser groups were similar, and both of these showed smoother surface profiles than the other groups (Figures 2 and 3). The in 9 J/cm2 laser and sandblasted groups showed changes in the surface texture with the formation of microretentive grooves. Surface roughness was higher in 9 J/cm2 Nd:YAG laser and sandblasted groups compared to other groups. Based on Figures 2-4, the highest surface roughness was seen in the sandblasted group. In 5 J/cm2 laser group, small interconnected cracks were noted. Cracks were so small that they were detected only at x5000 magnification. Cracks were larger and deeper in 9 J/cm2 laser group. In all samples, tetragonal phase decreased after surface treatment. The slightest reduction in this phase was noted in 5 J/cm2 laser group. The phase reduction in 9 J/cm2 laser group was smaller than that in the sandblasted group. Tetragonal to monoclinic phase transformation was not seen in any sample (Figure 5). 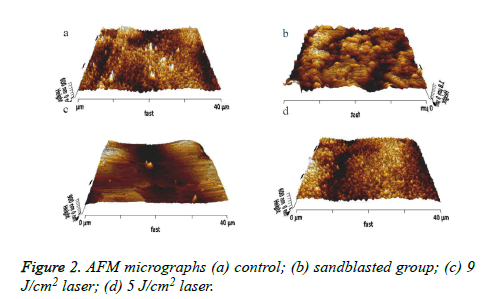 Figure 2: AFM micrographs (a) control; (b) sandblasted group; (c) 9 J/cm2 laser; (d) 5 J/cm2 laser. Figure 3: SEM micrographs of the surface of samples at ×1000 magnification: (a) control; (b) sandblasted group; (c) 9 J/cm2 laser; (d) 5 J/cm2 laser. 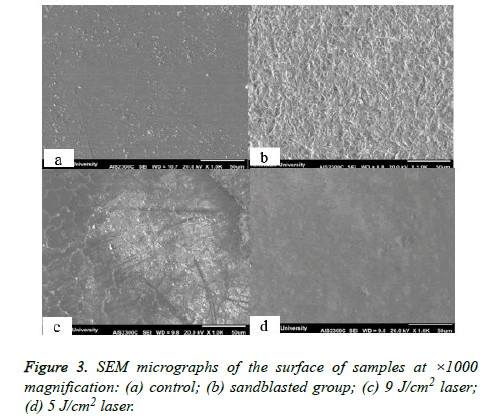 Figure 4: SEM micrographs of the surface of samples at x5000 magnification: (a) control; (b) sandblasted group; (c) 9 J/cm2 laser; (d) 5 J/cm2 laser. Figure 5: XRD diagram: (a) control; (b) sandblasted group; (c) 9 J/cm2 laser; (d) 5 J/cm2 laser. All surface treatment groups showed significant differences with the control group (P<0.05) while no significant difference was no noted among the sandblasted, 9 J/cm2 Nd:YAG laser and 5 J/cm2 Nd:YAG laser groups (Figure 6 and Tables 1-3). Table 1. The mean surface roughness values in different groups. Table 2. Bond strength values in the four groups. Table 3. The frequency of modes of failure. Figure 6: Shear bond strength diagram. All three modes of failure were seen in almost all groups. The highest frequency of adhesive failure was noted in the control group and the highest frequency of cohesive failure was seen in 9 J/cm2 laser group. The control and 5 J/cm2 laser groups did not show any cohesive failure (Figure 7). Figure 7: Fracture mode of samples:(a) Cohesive; (b) Adhesive. Sandblasted samples comprised the positive controls in our study for the purpose of comparison with other surface treatment methods. Many researchers believe that sandblasting with aluminum oxide particles is the most effective surface treatment to improve the bond to zirconia since it increases the surface roughness and results in micromechanical interlocking of luting cement [28-31]. Tsuo et al. recommended sintered zirconia sandblasting with 50 μ particles. We also used 50 μ alumina particles for sandblasting and obtained a high surface roughness and bond strength compared to the control group. Roughening the internal surface of ceramic restorations can increase the available surface area for cement penetration and subsequently improves the mechanical bond . Surface treatment with Nd:YAG laser creates uniform roughness on the zirconia surface and increases the microshear bond strength [28,27,34]. However, some studies are available reporting the inefficacy of Nd:YAG laser for improving the surface properties of zirconia . Our results showed that Nd:YAG laser increased surface roughness. Ersu et al. demonstrated that sandblasting created a rougher surface than laser and acid etching but in our study, sandblasting and 9 J/cm2 laser yielded similar surface roughness. It has been confirmed that macroscopic and microscopic irregularities caused by laser irradiation can effectively enhance the bonding mechanism and bond strength to enamel and dentin [36,37], which was in accordance with our findings. Some studies have indicated that sandblasting may affect the long-term clinical service of zirconia due to induction of tetragonal to monoclinic phase transformation [38-40]. This phase transformation can create a layer with high compressive strength that resists strength reduction due to surface defects [40,41]. Also, phase transformation during the process of surface treatment can decrease strength and increase the risk of fracture of zirconia because it decreases the phase transformation capacity of zirconia (3-4% increase in volume when stress is applied to confront crack propagation) in future critical circumstances. Thus, attempts must be made to minimize tetragonal to monoclinic phase transformation during surface treatment to guarantee long-term success of these restorations [8,42]. In our study, the XRD pattern showed no tetragonal to monoclinic phase transformation in sandblasted samples, which may be due to differences in methods and types of zirconia used. The SEM micrographs clearly showed that Nd:YAG laser modified the external surface of zirconia ceramic and yielded a smooth surface with irregular small cracks due to laser irradiation. This finding is in line with the results of previous studies reporting cracks on zirconia surfaces after laser treatment [34,43]. When higher laser energy was used, larger and deeper cracks were formed. Li et al. confirmed this finding as well . A study showed that cracks inevitably form due to thermal changes because volumetric changes occur during the process of freezing of melted material . Moreover, during laser treatment, local thermal changes can cause internal tension and stress that extend over the surface and penetrate deep into the material . Usumez et al. performed XRD and showed that Nd:YAG laser irradiation caused tetragonal to monoclinic phase transformation, which adversely affected the mechanical properties and compromised the long-term success of zirconia-based restorations . However, our study showed that Nd:YAG laser with the parameters used in our study caused no phase transformation and thus, zirconia-based restorations irradiated with this type of laser will probably have higher success rate. No phase transformation due to irradiation of Nd:YAG laser is an important finding since this laser increased the bond strength of zirconia to resin cement. Our study indicated that application of Nd:YAG laser significantly increased the bond strength in short-term comparable to that of sandblasting. In contrast, some studies have reported significantly lower shear bond strength of ceramics irradiated with laser compared to sandblasted samples [27,46]. These controversies may be due to different irradiation parameters and different methodologies of studies. Two energy densities of laser were used in our study and the results showed that by an increase in energy density, bond strength did not increase significantly. Earlier, Li et al. showed that increasing laser energy did not increase the bond strength . The major effect of laser energy is to convert light energy to heat. The most important interaction between laser and substrate is the absorption of laser energy by the substrate . Surface discoloration and water content as well as some other surface properties determine the amount of laser energy absorbed by the irradiated surfaces . On dental surfaces, energy is absorbed by the water molecules, crystalline structure of dentin and organic compounds. During hard tissue ablation, laser causes micro-explosions and results in macroscopic and microscopic porosities on the surface enhancing adhesion . Zirconia ceramic does not contain water and has an opaque color that can affect absorption of laser energy; for this reason, some researchers believe that laser irradiation may not significantly increase the micromechanical bond between cement and ceramic . However, some others have stated otherwise. Spohr et al. concluded that Nd:YAG laser irradiation is an effective surface treatment to create a bond between In-Ceram zirconia and Panavia cement. Also, Usumez et al. showed that Nd:YAG laser irradiation increased both surface roughness and shear bond strength. Our results also revealed increased surface roughness and microshear bond strength due to Nd:YAG laser irradiation; however, these two parameters did not increase by an increase in laser energy density. It should be noted that increased laser energy may result in defects in ceramic and decrease the mechanical properties of zirconia . Panavia F2.0 is a resin cement modified with MDP phosphate monomer. MDP monomer is resistant to hydrolysis due to the presence of a long carbonyl chain in its formulation . It has been confirmed that resin cements containing MDP monomer, irrespective of the type of surface treatment, can provide a durable bond [27,51]. A previous study revealed that in case of using MDP-containing primer, other surface treatments would not be required . But, a few other studies reported controversial results. A study in 2012 reported that acid etching of zirconia surface after applying a glaze layer and silane enhanced the shear bond strength of zirconia to resin cement but in cases where MDP containing primer was used instead of silane, the etched glaze layer was not effective for increasing the bond strength . In our study, Panavia resin cement containing MDP monomer was applied and yielded a bond strength value comparable to that in the sandblasted group. Due to the use of MDP-containing resin cement in our study, a long-term bond can be somehow ensured; however, thermocycling is often performed to simulate oral clinical setting to show the changes that occur in cement bond to ceramic over time . Thus, further similar studies are required to assess the effects of aging protocols on the results. Shear loads are mainly responsible for the failure of restorative materials. Thus, shear bond strength test was performed to assess the quality of resin bond to zirconia . In our study, shear bond strength test was used to assess the zirconia ceramic bond strength to resin cement. Quality of bond should not be assessed solely by bond strength testing; analysis of the mode of failure can provide important information about the quality of bond as well. Cohesive and mixed failure modes are clinically superior to adhesive mode of failure because adhesive failure is related to low bond strength . In the current study, all three modes of failure were seen in sandblasted and 9 J/cm2 Nd:YAG laser groups. Control and 5 J/cm2 groups did not show any cohesive failure, indicating that the cement-ceramic bond strength was lower than the cohesion of cement. This finding also justifies the minimum bond strength value obtained in the control group and somehow explains the lower bond strength in 5 J/cm2 laser group compared to other surface treatment groups. Clinical studies are required to confirm our findings. Moreover, the results for one zirconia ceramic system may not be generalizable to other commercially available systems. Future studies on the effects of each surface treatment on surface properties and bond strength of other types of zirconia ceramics are required. Nd:YAG laser irradiation can change the morphological properties of zirconia ceramic and fracture mode; as well laser increases surface roughness of zirconia. It can also increase the shear bond strength of zirconia to resin cement. Increasing Nd:YAG laser energy can result in higher surface roughness bit cannot cause a significant difference in microshear bond strength of zirconia. The fracture mode is changed from adhesive in control and 5J/cm2 groups to cohesive in 9J/cm2 groups. Nd:YAG laser with the parameters used in this study does not cause any phase transformation. Pilathadka S, Vahalová D, Vosáhlo T. The Zirconia: a new dental ceramic material. An overview. Prague Med Rep 2007; 108: 5-12. Chintapalli RK, Rodriguez AM, Garcia Marro F. Effect of sandblasting and residual stress on strength of zirconia for restorative dentistry applications. J Mechanic Behav Biomed Materials 2014; 29: 126-137. Mehta D, Shetty R. Bonding to zirconia: elucidating the confusion. Int Dent SA 2010; 12: 46-52. Denry I, Holloway JA. Ceramics for dental applications: a review. Materials 2010; 3: 351-368. Al-Amleh B, Lyons K, Swain M. Clinical trials in zirconia: a systematic review. J Oral Rehabil 2010; 37: 641-652. Manicone PF, Rossi Iommetti P, Raffaelli L. An overview of zirconia ceramics: basic properties and clinical applications. J Dent 2007; 35: 819-826. Ardlin BI. Transformation-toughened zirconia for dental inlays, crowns and bridges: chemical stability and effect of low-temperature aging on flexural strength and surface structure. Dental Materials 2002; 18: 590-595. Thompson JY, Stoner BR, Piascik JR, Smith R. Adhesion/cementation to zirconia and other non-silicate ceramics: where are we now? Dental Materials 2011; 27: 71-82. Wolfart M, Lehmann F, Wolfart S, Kern M. Durability of the resin bond strength to zirconia ceramic after using different surface conditioning methods. Dental Materials 2007; 23: 45-50. Lüthy H, Loeffel O, Hammerle CH. Effect of thermocycling on bond strength of luting cements to zirconia ceramic. Dent Mater 2006; 22: 195-200. Akin H, Ozkurt Z, Kirmali O, Kazazoglu E, Ozdemir AK. Shear bond strength of resin cement to zirconia ceramic after aluminum oxide sandblasting and various laser treatments. Photomedicine Laser Surg 2011; 29: 797-802. Kirmali O, Kustarci A, Kapdan A, Er K. Efficacy of surface roughness and bond strength of Y-TZP zirconia after various pre-treatments. Photomed Laser Surg 2015; 33: 15-21. Reddy SM, Vijitha D, Deepak T, Balasubramanian R, Satish A. Evaluation of Shear Bond Strength of Zirconia Bonded to Dentin After Various Surface Treatments of Zirconia. J Ind Prosthodont Soc 2014; 14: 38-41. Moon JE, Kim SH, Lee JB, Ha SR, Choi YS. The effect of preparation order on the crystal structure of yttria-stabilized tetragonal zirconia polycrystal and the shear bond strength of dental resin cements. Dental Materials 2011; 27: 651-663. Pittayachawan P. Comparative study of physical properties of zirconia based dental ceramics: UCL (University College London); 2009. Matinlinna JP, Vallittu PK. Bonding of resin composites to etchable ceramic surfaces - an insight review of the chemical aspects on surface conditioning. J Oral Rehabil 2007; 34: 622-630. Della Bona A, Borba M, Benetti P, Cecchetti D. Effect of surface treatments on the bond strength of a zirconia-reinforced ceramic to composite resin. Braz Oral Res 2007; 21: 10-15. Haselton DR, Diaz-Arnold AM, Dunne JT Jr. Shear bond strengths of 2 intraoral porcelain repair systems to porcelain or metal substrates. J Prosthet Dent 2001; 86: 526-531. Shiu P, De Souza-Zaroni WC, Eduardo CdP, Youssef MN. Effect of feldspathic ceramic surface treatments on bond strength to resin cement. Photomed Laser Surg 2007; 25: 291-296.
de Melo RM, Valandro LF, Bottino MA. Microtensile bond strength of a repair composite to leucite-reinforced feldspathic ceramic. Braz Dent J 2007; 18: 314-319. Güler AU, Yilmaz F, Yenisey M, Güler E, Ural C. Effect of acid etching time and a self-etching adhesive on the shear bond strength of composite resin to porcelain. J Adhes Dent 2006; 8: 21-25. Della Bona A, Shen C, Anusavice KJ. Work of adhesion of resin on treated lithia disilicate-based ceramic. Dent Mater 2004; 20: 338-344. Gökçe B, Ozpinar B, Dündar M, Cömlekoglu E, Sen BH. Bond strengths of all-ceramics: acid vs laser etching. Oper Dent 2007; 32: 173-178. Usumez A, Hamdemirci N, Koroglu BY, Simsek I, Parlar O. Bond strength of resin cement to zirconia ceramic with different surface treatments. Lasers Med Sci 2013; 28: 259-266. Chevalier J. What future for zirconia as a biomaterial? Biomaterials 2006; 27: 535-543. Kirmali O, Barutcigil C, Ozarslan MM, Barutcigil K, Harorli OT. Repair bond strength of composite resin to sandblasted and laser irradiated Y-TZP ceramic surfaces. Scanning 2015; 37: 186-192. Liu L, Liu S, Song X, Zhu Q, Zhang W. Effect of Nd: YAG laser irradiation on surface properties and bond strength of zirconia ceramics. Lasers Med Sci 2015; 30: 627-634. Kitayama S, Nikaido T, Takahashi R, Zhu L, Ikeda M. Effect of primer treatment on bonding of resin cements to zirconia ceramic. Dent Mater 2010; 26: 426-432. Blatz MB, Phark J-H, Ozer F, Mante FK, Saleh N, Bergler M. In vitro comparative bond strength of contemporary self-adhesive resin cements to zirconium oxide ceramic with and without air-particle abrasion. Clin Oral Invest 2010; 14: 187-192. Kern M, Barloi A, Yang B. Surface conditioning influences zirconia ceramic bonding. J Dent Res 2009; 88: 817-822. Tsukakoshi M, Shinya A, Gomi H, Lassila LV, Vallittu PK, Shinya A. Effects of dental adhesive cement and surface treatment on bond strength and leakage of zirconium oxide ceramics. Dental Materials J 2008; 27: 159-171. Tsuo Y, Yoshida K, Atsuta M. Effects of alumina-blasting and adhesive primers on bonding between resin luting agent and zirconia ceramics. Dental Materials J 2006; 25: 669-674. Cavalcanti AN, Pilecki P, FoxtonRM, Watson TF, Oliveira MT, Gianinni M. Evaluation of the surface roughness and morphologic features of Y-TZP ceramics after different surface treatments. Photomed Laser Surg 2009; 27: 473-479. Paranhos M, Burnett Jr LH, Magne P. Effect Of Nd: YAG laser and CO2 laser treatment on the resin bond strength to zirconia ceramic. Quintessence international (Berlin, Germany: 1985) 2011; 42: 79-89. Ersu B, Yuzugullu B, Yazici AR, Canay S. Surface roughness and bond strengths of glass-infiltrated alumina-ceramics preparedusing various surface treatments. J Dentistry 2009; 37: 848-856. Torres CRG, Caneppele TMF, de Lazari RDM, Ribeiro CF, Borges AB. Effect of dental surface treatment with Nd: YAG and Er: YAG lasers on bond strength of resin composite to recently bleached enamel. Lasers Med Sci 2012; 27: 755-760. Marimoto AK, Cunha LA, Yui KC, Huhtala MF, Barcellos DC. Influence of Nd:YAG laser on the bond strength of self-etching and conventional adhesive systems to dental hard tissues. Oper Dent 2013; 38: 447-455. Zhang Y, Lawn BR, Malament KA, Van Thompson P, Rekow ED. Damage accumulation and fatigue life of particle-abraded ceramics. Int J Prosthodont 2006; 19: 442-448. Kosmac T, Oblak C, Jevnikar P, Funduk N, Marion L. The effect of surface grinding and sandblasting on flexural strength and reliability of Y-TZP zirconia ceramic. Dent Mater 1999; 15: 426-433. Zhang Y, Lawn BR, Rekow ED, Thompson VP. Effect of sandblasting on the long-term performance of dental ceramics. J Biomed Mater Res B Appl Biomater 2004; 71: 381-386. Schubert H, Frey F. Stability of Y-TZP during hydrothermal treatment: neutron experiments and stability considerations. J Euro Ceramic Soc 2005; 25: 1597-1602. Akyil MS, Uzun IH, Bayindir F. Bond strength of resin cement to yttrium-stabilized tetragonal zirconia ceramic treated with airabrasion, silica coating, and laser irradiation. Photomed Laser Surg 2010; 28: 801-808. Noda M, Okuda Y, Tsuruki J, Minesaki Y, Takenouchi Y. Surface damages of zirconia by Nd:YAG dental laser irradiation. Dent Mater J 2010; 29: 536-541. Kohorst P, Borchers L, Strempel J, Stiesch M, Hassel T. Low-temperature degradation of different zirconia ceramics for dental applications. Acta Biomater 2012; 8: 1213-1220. Kara HB, Ozturk AN, Aykent F, Koc O, Ozturk B. The effect of different surface treatments on roughness and bond strength in low fusing ceramics. Lasers Med Sci 2011; 26: 599-604.
van As G. Erbium lasers in dentistry. Dent Clin North Am 2004; 48: 1017-1059, viii. Coluzzi DJ. Fundamentals of dental lasers: science and instruments. Dent Clin North Am 2004; 48: 751-770. Spohr AM, Borges GA, Júnior LH, Mota EG, Oshima HM. Surface modification of In-Ceram Zirconia ceramic by Nd:YAG laser, Rocatec system, or aluminum oxide sandblasting and its bond strength to a resin cement. Photomed Laser Surg 2008; 26: 203-208. Valandro LF, Della Bona A, Antonio Bottino M, Neisser MP. The effect of ceramic surface treatment on bonding to densely sintered alumina ceramic. J Prosthet Dent 2005; 93: 253-259. Foxton RM, Cavalcanti AN, Nakajima M, Pilecki P, Sherriff M. Durability of resin cement bond to aluminium oxide and zirconia ceramics after air abrasion and laser treatment. J Prosthodont 2011; 20: 84-92. Zhang W, Masumi SI, Song XM. Bonding property of two resin-reinforced glass-ionomer cements to zirconia ceramic. Quintessence International (Berlin, Germany: 1985) 2009; 41: e132-140. Cura C, Özcan M, Isik G, Saracoglu A. Comparison of alternative adhesive cementation concepts for zirconia ceramic: glaze layer vs zirconia primer. J Adhes Dent 2012; 14: 75-82. D'Amario M, Campidoglio M, Morresi AL, Luciani L, Marchetti E. Effect of thermocycling on the bond strength between dual-cured resin cements and zirconium-oxide ceramics. J Oral Sci 2010; 52: 425-430. Toledano M, Osorio R, Osorio E, Aguilera FS, Yamauti M, Pashley DH. Durability of resin-dentin bonds: effects of direct/indirect exposure and storage media. Dental Materials 2007; 23: 885-892.